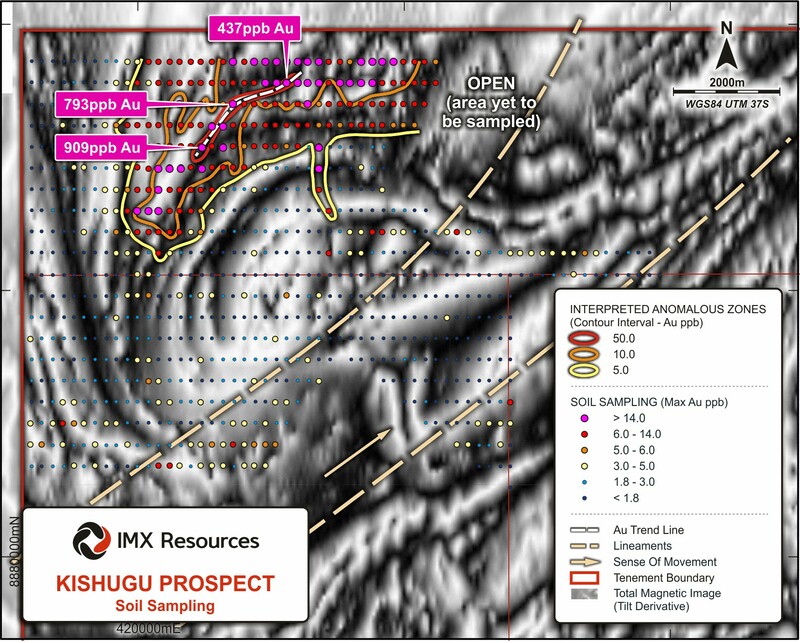 The Kishugu Gold Target is an extensive, coherent gold-in-soil anomaly measuring 5.5km by 600m, with up to 0.9g/t Au within the main trend (904ppb). 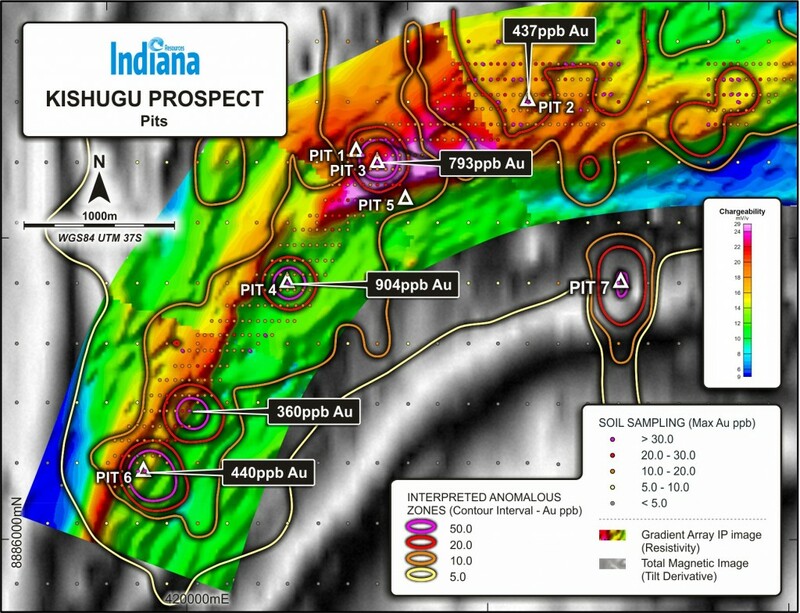 Together with strong coincident IP anomalies and the presence of associated pathfinder elements such as As, Bi and Ag, Kishugu represents an outstanding gold exploration target. Kishugu (and Naujombo) are associated with the same structural corridor and both anomalies exhibit very similar multi-element signatures (arsenic, bismuth and silver). Given that these two targets are located 35km from one another, the potential exists to identify a significant gold camp should the anomalies confirm the presence of economic gold mineralisation. An initial soil sampling program that consisted of 168 sample points on a broad reconnaissance grid 400m x 200m identified a large anomaly that measured 4km x 5.5km. Within the broader anomaly, the soil sampling program returned peak gold values of 904ppb Au, 793ppb Au and 437ppb Au, with these high values defining a 2km linear trend. This 2km trend was significant on its own, particularly given that the gold concentrations are the equivalent of 0.9, 0.8 and 0.4 g/t. The figure below shows the geochemistry results from the first stage soil sampling program. An in-fill soil sampling program was subsequently carried out with 404 surface soil samples which in-filled the anomaly on a 50m by 100m basis, within the existing 400m by 200m sampling grid along the main trend, where the highest concentration of gold values occur. The in-fill sampling returned peak gold values of 440ppb Au, 360ppb Au and 102ppb Au with all results shown in the figure below. 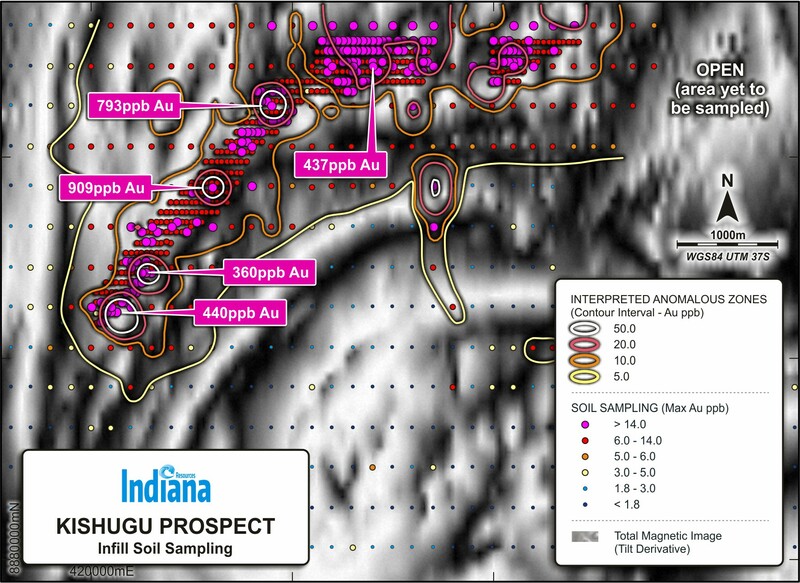 The in-fill sampling redefined the Kishugu anomaly as measuring 5.5km in length by 600m in width at gold values of greater than 10ppb Au, with significantly higher concentrations occurring within this trend. This in-fill has tightened the width of the anomaly and confirmed the presence of anomalous pathfinder elements such as arsenic, bismuth and silver. 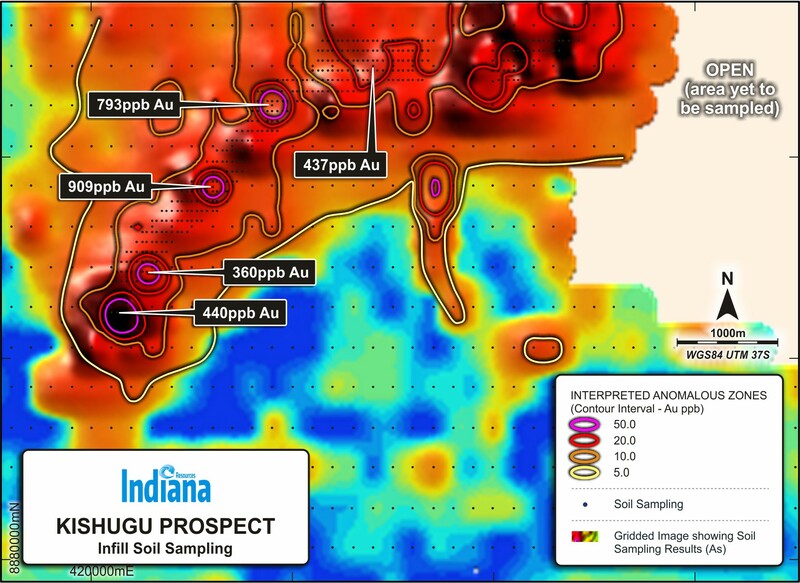 Arsenic anomalism often correlates with structures, a primary requirement for gold mineralisation, and at Kishugu it shows a very close relationship with the gold anomalism as shown in the figure below. 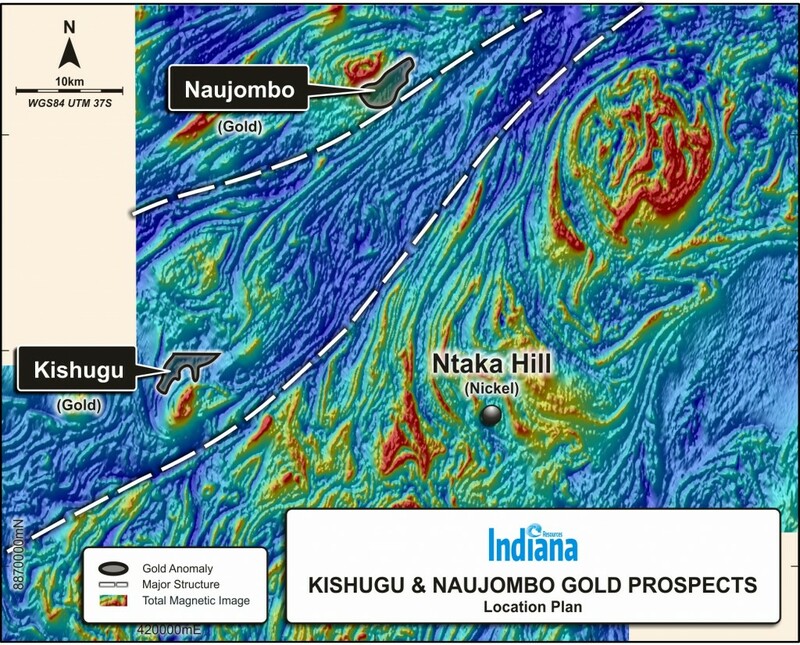 During the December Quarter 2014, the Company completed an IP survey over the soil anomaly at Kishugu, which appears to have identified the eastern edge of the system. Data from this survey shows a large, broad chargeability anomaly that is coincident with a sizeable geochemical signature and shows a correlation between the IP response and elevated levels of gold-in-soils across much of the anomaly. This detailed soil sampling has confirmed the Kishugu anomaly and together with geophysical surveys and geological mapping provided valuable targeting information. During the December Quarter 2015, program that comprised seven test pits, dug to a depth of 7m to 9m, six of which were situated on different targets within the anomaly and a seventh control pit that was located outside the anomaly was completed. 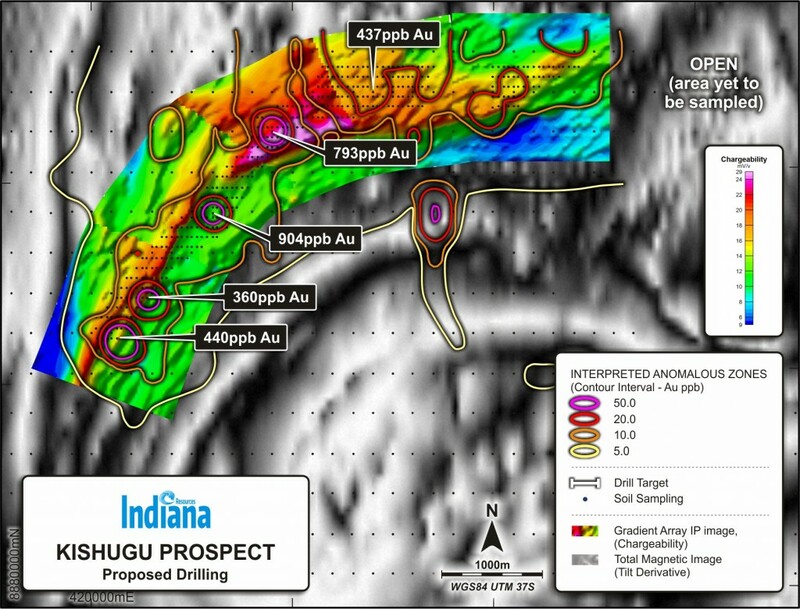 Downhole channel samples were taken at 1m intervals in each pit and assay results showed strong gold anomalies in all holes except the control pit (Pit 7). 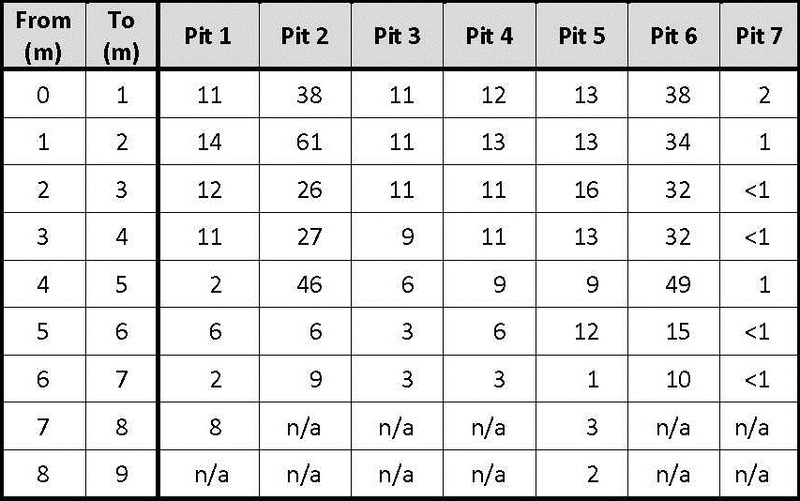 The results shown in the below table confirm the strong anomalism indicated by the previous soil sampling program.